New guidelines will help town planners and developers to protect the habitat of the region’s iconic cassowary and mahogany glider. Habitat corridors connecting sections of the Wet Tropics World Heritage Area are very important for the long term survival of cassowaries. Ecological corridors are a vital part of every Council’s new planning scheme. Good planning makes sure that their habitat is conserved and includes ecological corridors for wildlife to move across the landscape. You can read more in the media release and cassowary guidelines flyer. 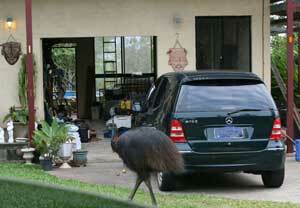 You can download the full Cassowaries in Planning Schemes Guideline.